Walt Disney made many successful films abroad, mostly because he had funds that had to be spent in other countries, but sometimes because a story intrigued him so much that his quest for authenticity lead him to film there for accuracy. Having had success with a film called Almost Angels a year prior, which was filmed in Austria, he set his sights once more on this beautiful European country. This film is based on a book based on a true story called The Dancing White Horses of Vienna by Colonel Alois Podhajsky. Arthur Hiller was hired to direct his only Disney film, who at the time was mostly a TV director. AJ Carothers adapted the screenplay, his first of several Disney projects. Like other internationally filmed Disney movies, there aren't many familiar faces for Disney fans. However, audiences at the time may have recognized two actors. Well known screen star Robert Taylor was cast in the lead role towards the end of his film career and TV star Eddie Albert plays Rider Otto. He later found success on shows like Green Acres and Petticoat Junction. Filming was done entirely on location in Vienna, Austria, in many of the locations that the real story took place. The Sherman Brothers wrote a song for the film called "Just Say, Auf Wiedersehen." The film opens with a narrated history of the Lipizzan horses set to footage of the stallions and ponies playing in a field. The movie takes place in the Spring of 1945 towards the end of World War II. Col. Podhajsky gets a visit at the Spanish Riding School from Nazi generals denying a request to remove the horses from Vienna for their safety and forcing them to remain open, despite all of his staff being sent to war. Fearing for the safety of the horses, Podhajsky sneaks the horses out of Vienna on a train to a refuge castle. A group of men unsuccessfully attempt to steal the horses to get away. Podhajsky hears that an American general, General George S. Patton Jr., will give money to help save the school if they can throw a private performance for him. The performance earns them the protection of the American Army. A battle ensues as they attempt to relocate the horses, which are only saved because they mixed the Limizzans with other common horses to confuse the Nazis. Upon their joyous return to Vienna, they give their first performance since the Nazis invaded to tremendous applause. Miracle of the White Stallions was released on March 29th, 1963. While critics recognized the animal actors, they generally bashed the film. Their complaints included the plot being boring for kids and not exciting enough for adults, the actors performances being too cold and calculated and the long run time. It didn't strike a chord with the public and was a failure at the box office. It debuted on TV in 1965 and made its home video debut in 1987. While Miracle of the White Stallions is beautifully shot and has a few great moments, it is a generally disappointing film. The audience is given little reason to care for the characters or an emotional understanding of why it is important to save the horses, other than to preserve tradition. Perhaps one of the weirdest things about the film is the clash of accents. Robert Taylor makes no attempt at hiding his stern American accent in a cast of real Austrian actors, putting something that doesn't belong at the center of a film that otherwise strives for authenticity. As the film unfolds, all of the Austrians seem very concerned with protecting the horses, but the audience doesn't get to see a performance until the second half of the film, making it hard to understand why they are so revered. 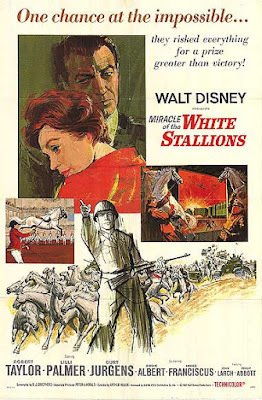 The real Colonel Podhajsky choreographed the horses in the film and their dance sequences are interesting, but certainly not worth sitting through the rest of the film to see. Calling it bad would be an overstatement, but it's not particularly great either. Miracle of the White Stallions is currently available on DVD. The film is presented in fullscreen, but it would have originally been released in matted widescreen, most likely a 1.75:1 aspect ratio. The opening credits are presented in open matte since they would get cut off it shown in the fullscreen aspect ratio. The film looks decent, but is flawed at times with flickering and discoloration. There are no bonus features. Thoroughly enjoying catching up with these wonderful movies! Apparently,only a horse lover would understand the film. I saw it as a child long ago, have seen it twice in the last 10 years, and went to see the real Lippizan Stallions in performance. I have adored each viewing, and espcially seeing them in person. I have yet to find someone who doesn't like the movie. Another horse lover totally concurs with the comment on Sept 23, 2011. I and my husband just saw the Lipizzaner horses perform at the Spanish Riding School in Vienna, and my over 50 year dream has been to see the horses perform in Vienna. This wish was inspired by the Walt Disney movie. I too am a horse lover.